Yancey, Alaska was a quiet town . . . until the truth of what was hidden in the depths off the coast began to appear. has settled in his town and doesn't appear to be moving on. But dealing with the reality of Bailey's reappearance is a tougher challenge. She broke his heart, but she is not the same girl who left Yancey. He let her down, but he's not the same guy she left behind. Can they move beyond the hurts of their pasts and find a future together? 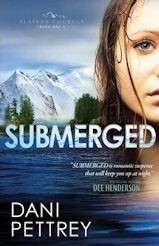 If you would like to read the first chapter of Submerged, go HERE. I will say right off that this was what I call a "read-in-one-sitting-book", a term that I give to books that are so good that I read it in one sitting if I could, or as close to one sitting as possible. An author probably hates to hear something like this, but after I got the book, it just didn't grab me for some reason. With the review dates at hand, I grabbed it to read in between waiting on customers at our garage sale, and was I ever pleasantly surprised. 1) The characters. They are all very likable, and the McKenna family made me wish I was a part of them, fictional though they may be. And it might sound strange, but I identified a lot with Bailey, the heroine of the story. Her history and story reminded was a reminder that God does indeed forgive and not hold sins against us. Even the sins she had committed. 2) The plot. The book just dives in with a sabotaged plane crashing into the water and keeps on going from there. A lot of suspense, drama, action, and more suspense. It kept this suspense/mystery lover hooked and eagerly turning pages. 3) Romance. Yeah, I can handle some of that in books, and the romance plot woven throughout the suspense was well done and not super sappy. I was even hoping for a good ending in that department. 4) Christian content. There was a great message throughout the book of how God can change anyone and forgive any sin. I like it when a novel brings a message like that. This was the first book in a series, and I can't wait to read more in the series. As far as I can tell, this is the first book by this author, and it is a tremendous debut novel. I am definitely looking forward to reading more from her.